There have been many attempts to define creativity. In 1961, a researcher named Mel Rhodes set out to find the single unifying definition of creativity. He couldn’t do it, and that’s probably a good thing. Otherwise, we would continually judge ourselves against one definition. From the forty definitions of creativity that he found in 1961, Rhodes saw about four clusters. 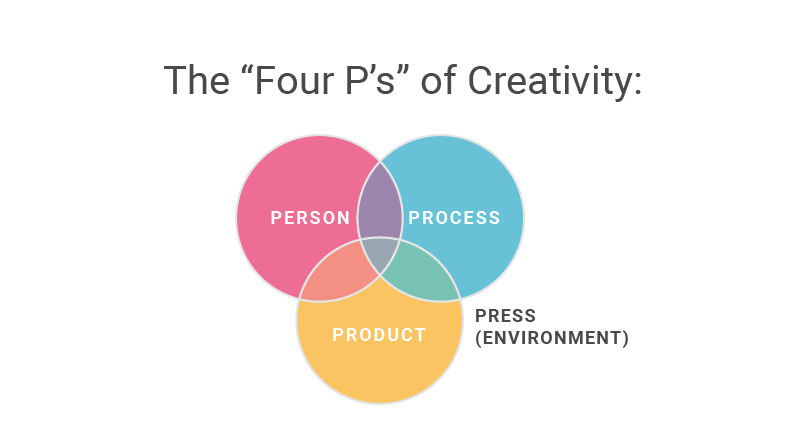 One cluster of definitions centered on what a creative person was. What’s a creative personality like? Psychologists who were working to identify geniuses and eminent personalities had a lot to say about the creative personality. Many of the early studies on leadership that attempted to list the traits or characteristics of the ideal leader were in the “person” category. A second cluster of definitions described a creative process. What are the means by which people develop new ideas and put those ideas into action? People like Alex Osborn (the advertising executive who invented brainstorming and was the “O” in the advertising agency BBD&O) were doing a lot of work in the area of creative process and Creative Problem Solving. A third group of definitions focused on a creative product. How do you know if something is creative? How do you know if art is true or beautiful? How do you know if a product is going to sell? The final batch of definitions emphasized the press—that is, the environment in which people feel most likely to contribute their ideas, get involved in the life of the organization, and make the organization’s initiatives their own. The press is where leaders have the most influence in nurturing or destroying the creativity of those who work for them. Did you ever wonder what the “academic” definition of creativity was? It’s not just one definition but a whole cluster of definitions. How would YOU define creativity?